Dr John Yiannakis will present an interesting lecture about the Greek–Australian women, on Thursday 16 June, at the Greek Centre, as a part of the Greek History and Culture Seminar series offered for sixth consecutive year by the Greek Community of Melbourne. 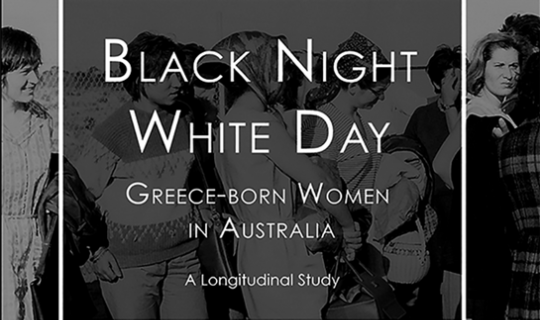 In his lecture Dr Yiannakis will discuss the results of a unique 45 year longitudinal study entitled “Black Night, White Day: Greece-born Women in Australia”, that addresses the integration of 78 single brave young Greek women who left their homeland villages and small towns to resettle in Australia during the 1960s. Interviews with the women in Greece prior to their departure were designed to find out why they responded to the programme and subsequent interviews in Australia (and in Greece with those who returned) over the next four decades were intended to evaluate their adaptation. Interviews conducted with their spouses, relatives living in Greece, and with their children, also yielded a great deal of information on their adaptation. Interesting, distinct, and perceptive, this research shows that migrant women are strong, resilient and central to migration and adaptation processes. By focusing on their aspirations and experiences this research places females at the centre of the migration narrative and debate. Dr John Yiannakis OAM has a strong research record in Greek settlement, migration and adaptation to Western Australia. His work has seen him develop expertise in the history of interactions between Australia and Greece, and their people. For many years Dr Yiannakis lectured Modern and Ancient History at Tuart College where he was Head of the Social Sciences Department. More recently, Dr Yiannakis has worked as a Research Fellow at Curtin and Murdoch Universities. He is the author of a number of books and articles, the most recent being “Black Night, White Day: A longitudinal study of Greek women in Australia”. John continues to investigate the role of Lemnos in the Anzac Gallipoli campaign of 1915.